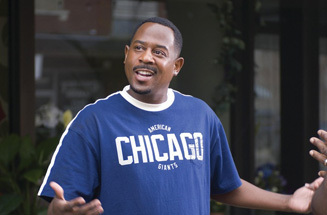 If you've seen Meet the Parents, Sweet Home Alabama or The Family Stone, then you've pretty much already seen Welcome Home Roscoe Jenkins, only slightly more superior forms of it. What's interesting is that each of the aforementioned movies was made this century, which makes me wonder if Hollywood is incapable of copying comedies that are more than a decade old. Our memories should at least be allowed to fade a little before studios recycle the same material. Marin Lawrence stars as Doctor R.J. Stevens, a popular talk show host and self-help author, though the "doctor" part is just a stage name. R.J. is the talk of Hollywood after announcing his engagement to Bianca Kittles (Joy Bryant), a Paris Hilton wannabe and latest winner of Survivor, an honor that has inflated her ego. R.J. also has a son named Jamaal (Damani Roberts), who loves soccer but doesn't much care for the glitz and glamour of Tinseltown. That's why he keeps in close touch with R.J.'s parents (Margaret Avery and James Earl Jones), your typical salt of the earth grandparents living in Georgia. It's their 50th wedding anniversary and they invite R.J., a.k.a. Roscoe Jenkins, to join in the family festivities. We get the usual assortment of eccentric family members, who all greet Roscoe with a subtle disdain because he left his roots in the South and ran off to Los Angeles. But seeing as though no one in his family ever showed him much support, can you blame him?